Pop group led by singer Carol Decker. Disintegrated later, but Decker still tours the nostalgia circuit. The singer apparently is a Star Trek enthusiast, because T'Pau is a character with an important role in Amok Time (episode 30, first broadcast September 15, 1967). 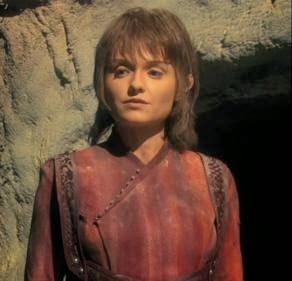 T'Pau is the priestess who is charged with performing the so-called Koon-ut-kal-if-fee wedding ceremony on the planet Vulcan for doctor Spock and his fiancée, T'Pring. Too bad for Spock, but the wedding was cancelled. And regarding T'Pau: that was a kind of Vulcan heroine. The priestess led the rebellion of the Syrranites against the Vulcanus supreme command and then turned down her well-deserved reward, a seat in the Federal Council.